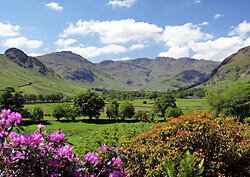 Long House Cottages are situated in the beautiful Great Langdale valley in the heart of the Lake District National Park. Enjoying a peaceful location near the foot of the Langdale Pikes, the cottages stand in a beautiful south facing terraced garden, which has superb mountain views of the head of the valley. We have four self-catering holiday cottages available, sleeping from two to six people. The cottages have private off-road parking and WiFi Internet access. Sorry but we do not allow pets. The Great Langdale valley contains the two small villages of Elterwater and Chapel Stile, originating around the old gunpowder works and slate quarry. Together with the small lake of Elterwater, Skelwith Force, the Langdale Pikes and high surrounding fells, Langdale offers some of the most interesting and varied walking country in the Lakes, with many walks starting straight from the door! Our central location also makes us ideally situated for exploring the rest of the National Park and Cumbria. 3 Cottages, each sleeping 2 to 4 people. 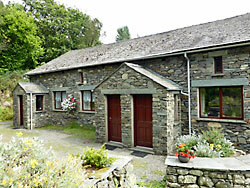 Converted from a traditional Lakeland barn, with great attention paid to detail, comfort and facilities. 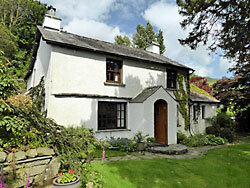 Traditional Lakeland cottage with lots of character, dating from the 17th century. Sleeps up to 6 people in 3 bedrooms each with en-suite bathroom.